I’ve a couple of trips to tell you about this month. My February began in the delightful Andalucían town of Vejer de la Frontera, on the Costa de la Luz, where I was a guest at Annie B’s Spanish Kitchen. Annie not only showed me around her home-town, where we feasted on delicious tapas, but she also took me to the fish market at the nearby town of Barbate, where we bought the delicious fresh ingredients we would use for our cooking weekend. I’ll be telling you all about Annie B’s fabulous Spanish kitchen in a separate post, later. My second trip was somewhere that many British expats take regular visits to. Just three hours along the coast, it’s a popular outing to stock up on British goods and groceries we can’t always get hold of in Spain. You know how we English love our cups of tea, so a trip to British supermarket, Morrison’s, can be a bit of a treat. I’ve been to Gibraltar many times before, but I’ve always driven through the border on previous occasions. 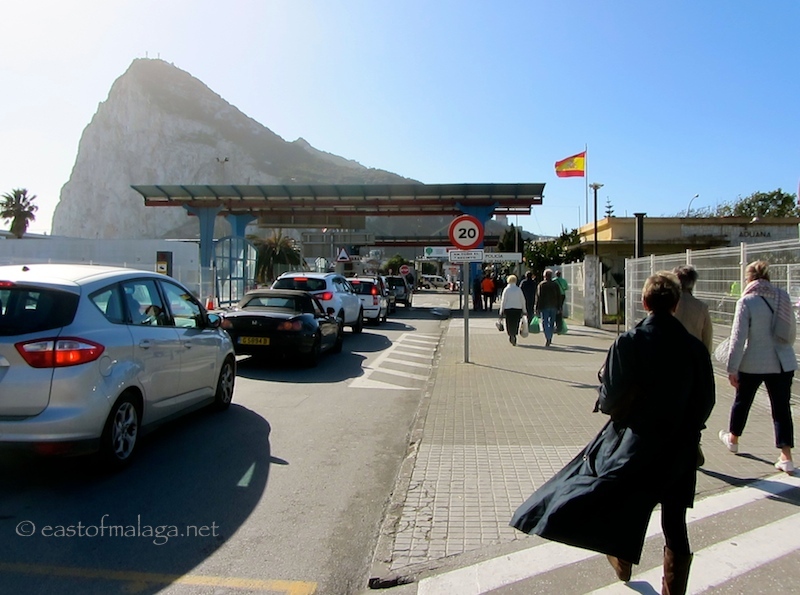 This time, I was on a coach rather than in a private car, and as there was a bit of a queue of vehicles, some of us decided to hop-off the coach and walk across into Gibraltar. Because Gibraltar is so small (just over 6.5 square kilometres), and within that area is the famous 426m high Rock, space is at a premium. 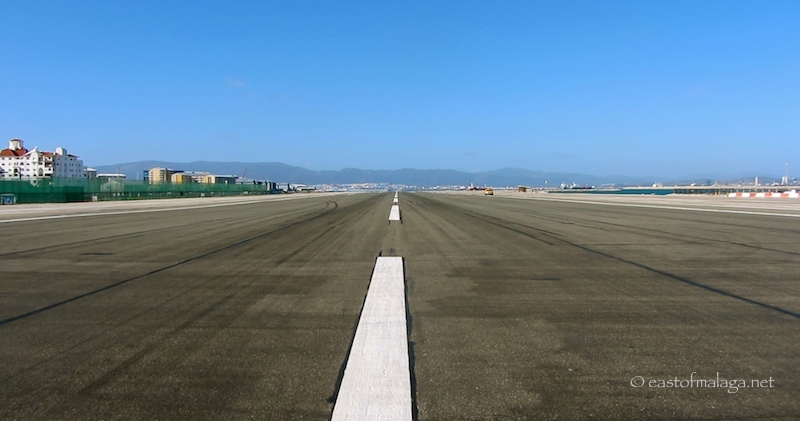 This means that the peninsula’s runway is bisected by its busiest road, Winston Churchill Avenue. Each time an aircraft wants to land or depart, barriers come down to prevent motor vehicles from crossing the airfield. As you can imagine, it causes quite a spectacle …. and a queue! 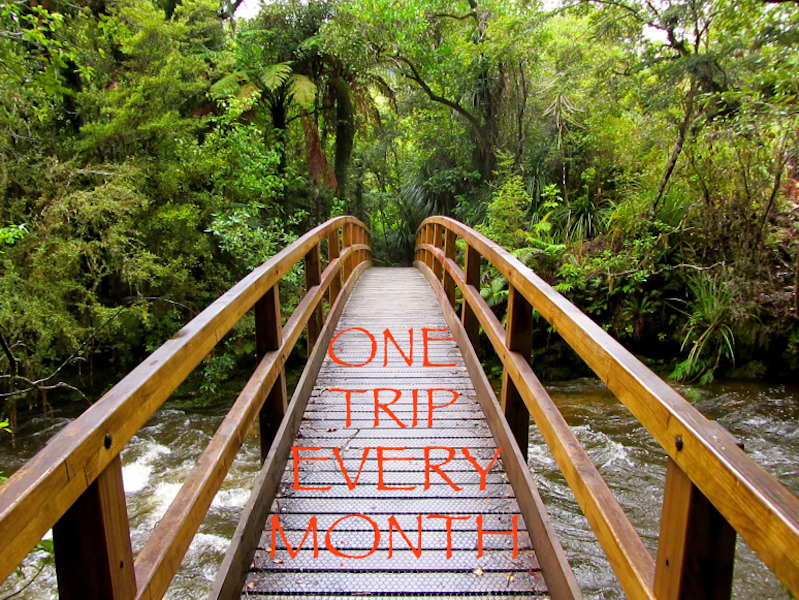 So there you have it – my contribution to the One Trip EVERY Month Challenge this month is two for the price of one! This entry was tagged Andalucía, Europe, Gibraltar, life, One trip EVERY month, One trip EVERY month Challenge, Spain, travel, Vejer de la Frontera, weekly image of life, white villages. Bookmark the permalink. Visited Gibraltar last New Year while staying near Marbella, amazing views from the top of the rock and the monkeys are quite entertaining! Would have to agree though a day trip is long enough. Queues to drive back out were particularly bad then and it took us 2 hours….I won’t rush back!! It’s a funny sort of place, Gibraltar. I always enjoy a day trip there (2-3 times a year), but I wouldn’t like to live there. You’re right about the queues, Susan – sometimes they are horrendous! That’s crazy that they have to stop the traffic in Gibraltar for the planes to land, sounding much like a railroad crossing! Sounds like you had two good trips in February! Can’t wait to hear about Annie’s. It IS a crazy runway, but the only way to fit one into such a small space! Looks as though you have had a great month Marianne, I have not made it anywhere this month, been to wet and wild !! Andalucia next week for three weeks and thanks to you the Number one visit will be the C.A.C in Malaga, can’t wait to see all that fantastic street art. 🙂 may even be tempted to post some pictures on my return ? You need to wander around the streets immediately on your right as you come out of the CAC museum. Don’t forget to visit the Atarazanas municipal market nearby while you’re in Malaga. There’s great tapas to be had at either of the two bars in there. Great two for one. Getting groceries and just getting there makes for a unique story. I can just picture the crossings now. I just wonder how many planes arrive and take off a day. I think I read somewhere that there were about 30 flights a week (not sure about that), but if so, that would make for 60 traffic stopping sessions, wouldn’t it? Beautiful photos Marianne. We regretted not having visited on our trip to Spain and Morocco several years ago. Great photos! The runway is a stunning shot, walking across… Wow! Is this for the month of March, Marianne? No, this is an account of my February trips, Amy. I LOVE meeting up with fellow bloggers!! I’m fortunate to have met up with people in New Zealand and Australia as well as in Spain. I’m sure I will have – met up a follow Swedish blogger last year … we had a great times together, but she are teacher, so not much time while school is on. 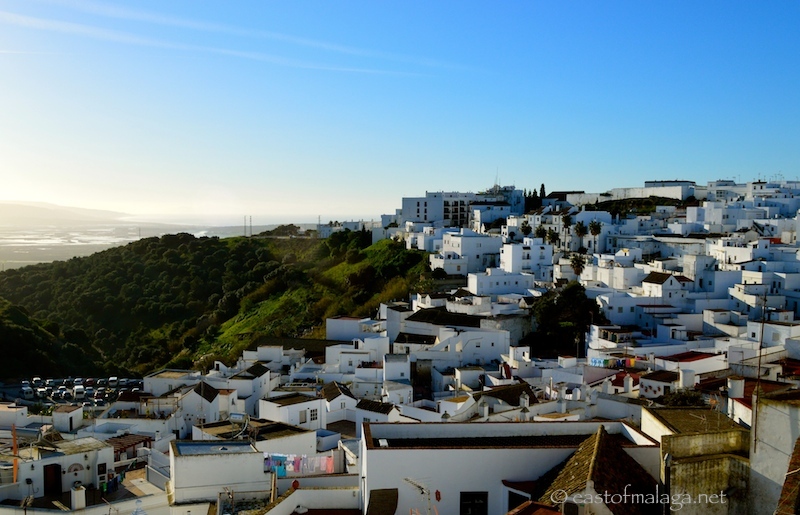 I was thrilled to see your mention of Vejer, since we will be there for 4 nights on our coming trip…. I followed the link to the lovely blog on Vejer, so we have more information now thank you Marianne. We had noticed how close Barbate was and wondered about fish :)… and birds. Great shots of Granada, I cant imagine a runway across a main road! I think you will love Vejer, Christine. Go to visit Annie B’s Spanish kitchen if you get the chance …. you’ll love it!! You should also have a look at Cadiz and Jerez, while you are nearby. Both can be easily reached from Vejer. Did I say Granada airport?? Running off to check now because I meant Gibraltar!! That runway photo is a spectaculair sight! I’ve driven across before, but it was quite surreal actually WALKING across the runway. I’ve never been down to Gibraltar and I so want to go!!! I’d also quite like to visit Ceuta and Melilla. Have you been? There was a TV series recently on Gib and I’d recorded it out of curiosity. I always mean to visit but am never sure if I’d love/hate it. Watched the last couple of episodes last night, just so I could delete them, and they were queuing madly at the border due to the troubles with Spain. And celebrating Gib Day in September. It’s worth a visit, Jo – but a day trip should do it! I couldn’t help but wonder just what ex pats would visit Morrison’s for. A three hour drive, the chance of a close cropped haircut and all for a bottle of tomato sauce?What’s the thing you miss most? This is one of Morrison’s busiest stores, David. Expats visit here for EVERYTHING! I only go once or twice a year (sometimes not at all for a couple of years), and often to take visitors to see the wild monkeys (NO, I don’t mean the tourists!! ), or just for the joy of visiting another country. I’ve always wondered about Gibralltar and it looks like it’s worth a visit – apart from Morrisons! Ah, but you can go to Morrisons anytime! Not sure I would recommend Gibraltar for a two week holiday, but it’s worth a day or two, Gilly. Well, I can tell you that Marks and Spencer’s is still there, Anna. Do you remember seeing the red public telephone boxes, and the policemen wearing their domed-helmets? 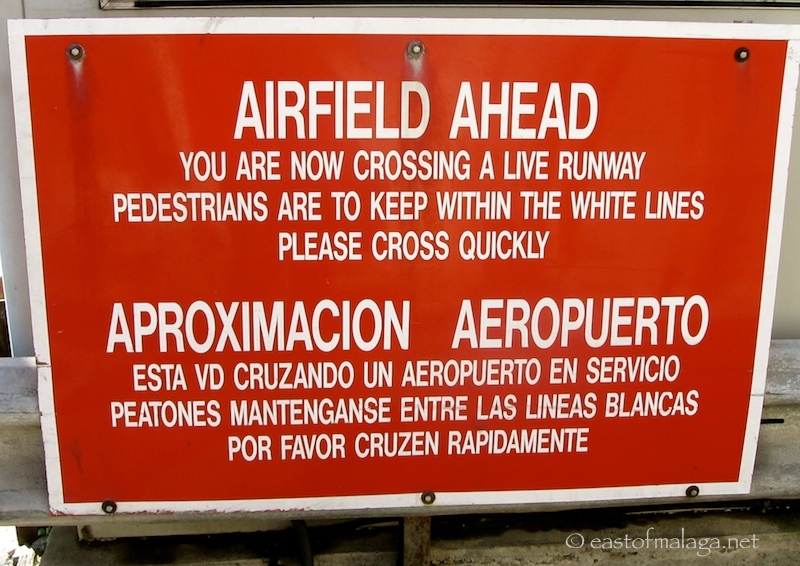 That sign makes it sound as though the runway is electrified! Hahaha … it’s certainly ELECTRIFYING at times!